This one is a bit of a puzzle, a private stone on a CWGC grave. CWGC give the rank as Private but the gravestone says Captain. He is not listed on SNWM so no help there. Any ideas? Grave/Memorial Reference: I. 126. 3. Minister of Religion ( Salvation Army) 33 Moat Road, Annan, called up July 1918. He died at Flyde Auxiliary Hospital, Kirkham of Influenza / Pneumonia, age 34, b Gt. Gowerton,Lincolnshire, e Dumfries. Widow residing Woodbridge, Guildford - Nov 1919. 33 Moat Road Annan in 1918. Nothing to indicate any earlier service. This one is a bit of a puzzle, a private stone on a CWGC grave. Private headstone is no puzzle - the family have declined a CWGC headstone. It was their choice. This is a private stone on a CWGC grave. As a civilian casualty, this would be difficult to find - he was one of those killed in the bombing of the Masonic Hall in Gretna, 1941. Additional information: Son of Mary Henderson, of Aberdour Cottages, Huntly, Aberdeen, and of the late William Henderson; husband of Ada Jane Henderson, of White Cottage, Carlisle Road, Annan. Died at Masonic Hall, Gretna. This grave has nothing to do with CWGC, it is privately owned. So likely a "Captain" in the Salvation Army and given that title on his gravestone rather than his military rank???? I would think so. It is certainly not his military rank at his death. The postings are a bit mixed alphabetically so here is a list of those posted so far. Another of those killed in the Gretna bombing. Note the discrepancy with the spelling of his name between the gravestone and CWGC. The spelling on CWGC ( REED) will have been provided / verified by the family. It is also the spelling his death was recorded under. Interestingly there are two different spellings on the headstone. We were contacted by Hazel Jones, granddaughter of John Lambley, who confirmed that the headstone is indeed not an error - he was a Captain in the Salvation Army. She advised that he was stationed at Annan SA Corps and joined up in July 1918, only to die in training. Thanks for that up-date David. John Lambley – age 34 – Private (155443) Royal Army Medical Corps Depot. John was a Captain in the Salvation Army at the hall in Greencroft Wynd in Annan when he enlisted in July 1918. He had just completed his training when he died of influenza and pneumonia in the Fylde Auxiliary Hospital at Kirkham, near Blackpool. Born 1884 Great Gonerby, Grantham, Lincolnshire. Son of Annie Lambley. In 1891 he was living with his grandmother Rebecca Lambley in Great Gonerby. He married Evelyn Beatrice Guy in 1905 in Nottingham, but Evelyn died in 1909 in Kent. In 1911 he was with his mother Annie 39 and his stepfather, Harry Heart, in Merrow, Guildford, Surrey. He was 26 and a widower, and was with his son John Henry James who had been born in Deptford, Kent in 1908. Husband of Edith A. (White) Lambley of 33 Moat Road, Annan and of 2 Acacia Villas, Woodbridge Road, Guildford, Surrey who he married in 1912 in Guildford. Died on Service on 5 October 1918. This is a private stone on a CWGC grave for Edward Woodhouse. Also mentioned on the stone is his son who died in France the same year. Try as I may, I cannot find the CWGC record for Thomas Woodhouse. 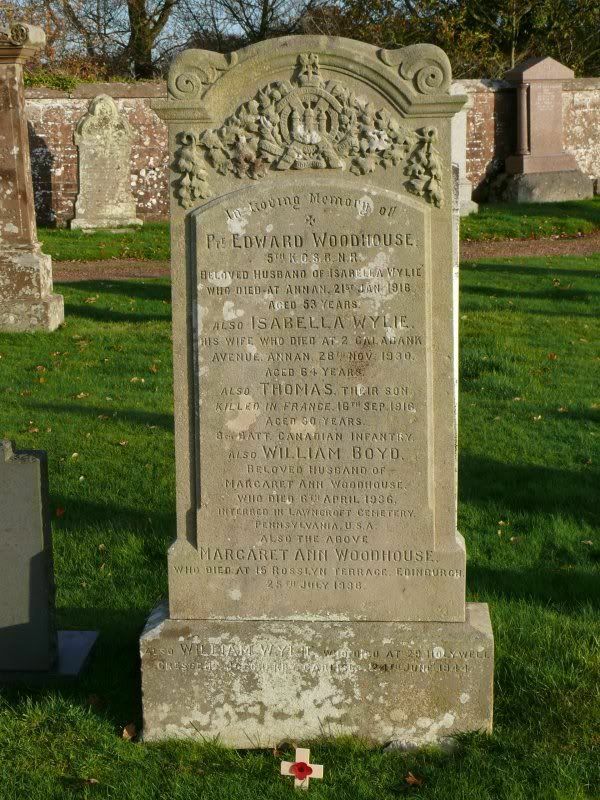 Additional information: Son of Thomas Woodouse; husband of Isabella Woodhouse, of 4, Port St., Annan. Grave/Memorial Reference: H. 103. 1. No wonder you couldn't find the son, Paul - he served as RONALD WYLIE! Edward Woodhouse – age 52 – Private (20054) King's Own Scottish Borderers. Edward was a fisherman who died of cancer at his home in Ednam Street, Annan. These companies were formed into the Royal Defence Corps in April 1916. Born 1861 in Annan as Edward Woodhouse Rae. Son of the late Thomas and Mary Ann (Rae) Woodhouse who married in 1872 in Annan. Husband of Isabella (Wylie) Woodhouse of 8 Ednam Street and of 4 Port Street, Annan who he married in 1886 in Annan. Died on Service on 21 January 1916. Also named on the Cochrane Company Roll of Honour. Served as Ronald Wylie – age 30 – Private (A22362) 8th Battalion, Canadian Infantry. In 1901, aged 15, Thomas Woodhouse was a labourer in the Cochrane & Company Works at Newbie, Annan and in 1907, as a fitter, he sailed from Liverpool for New Brunswick in Canada. He was living at 202 Carlton Street in Winnipeg, Manitoba when he enlisted in March 1915 and he sailed from Montreal in June. Born 1886 in Annan as Thomas Woodhouse. Son of Edward and Isabella (Wyllie) Woodhouse of 8 Ednam Street and of 4 Port Street, Annan. Missing in Action on 26 September 1916 and named on the Vimy Memorial, France. William Wylie Woodhouse, Corporal (1641) AIF survived his wound and the war. He returned to Australia on 25 January 1919. He died in Tamworth, New South Wales on 9 August 1957.